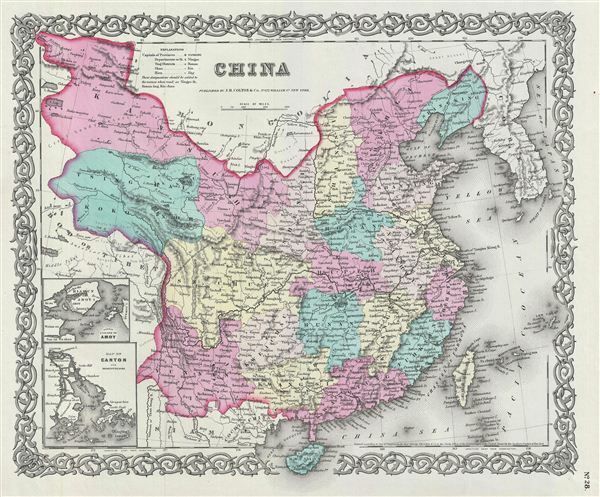 An excellent 1855 first edition example of Colton's map of China, Korea and Taiwan. Like most of Colton's Asia maps, this map was derived from an earlier wall map of the world produced by Colton and D. Griffing Johnson. Covers from Mongolia to Hainan and from Tibet to Korea. Identifies both the Great Wall and the Grand Canal. Inset maps in the lower left quadrant detail Canton and Amoy. Taiwan or Formosa is mapped vaguely, representing the poor knowledge of the region prior to the Japanese invasion and subsequent survey work in 1895. The map identifies both Hong Kong and Macao. The disputed body of water between Korea and Japan is here identified as the Sea of Japan. During this time in history, this region was dominated by China's last Imperial Dynasty, the Qing Dynasty. The Second Opium War or the Arrow War lasted from 1856 to 1860 resulting in China signing the treaty of Tientsin and Hong Kong was ceded over to the British. China also witnessed the Taiping Rebellion against the Qing Dynasty between 1851 and 1862. Considered one of the bloodiest wars in human history, it cost more than 20 million lives. This map also identifies various cities, towns, rivers, deserts, and an assortment of additional topographical details. Map is hand colored in pink, green, yellow and blue pastels to define provincial and state boundaries. Surrounded by Colton's typical spiral motif border. Dated and copyrighted to J. H. Colton, 1855. Published from Colton's 172 William Street Office in New York City. Issued as page no. 28 in volume 2 of Colton's 1856 Atlas of the World. Rumsey 0149.095 (1856 edition). Phillips (Atlases) 816.